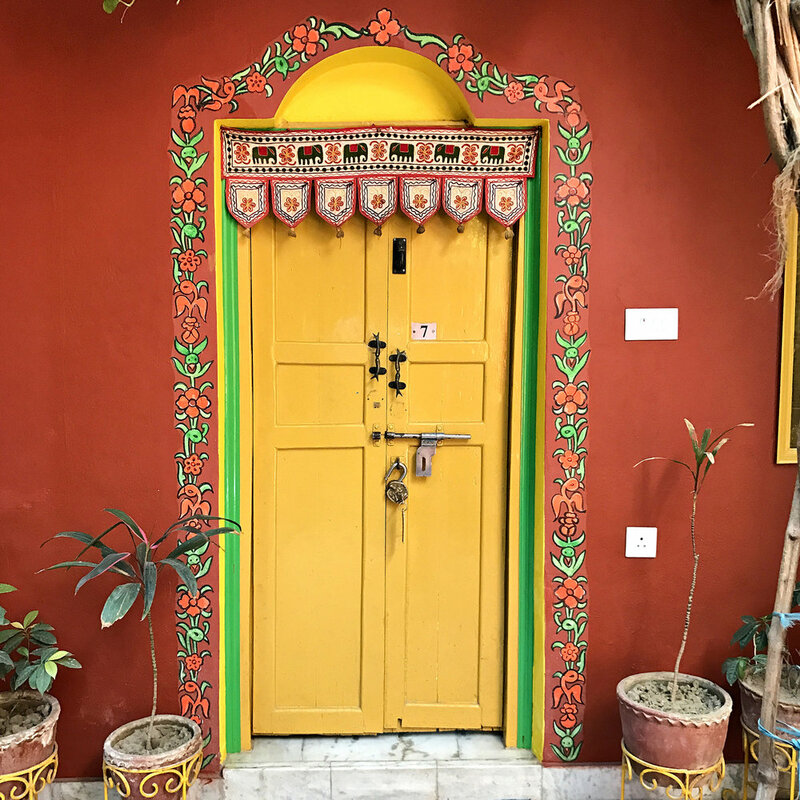 As you might have read in my blog-posts about my India trip, I sounded pretty fascinated about this little gem of a guesthouse. 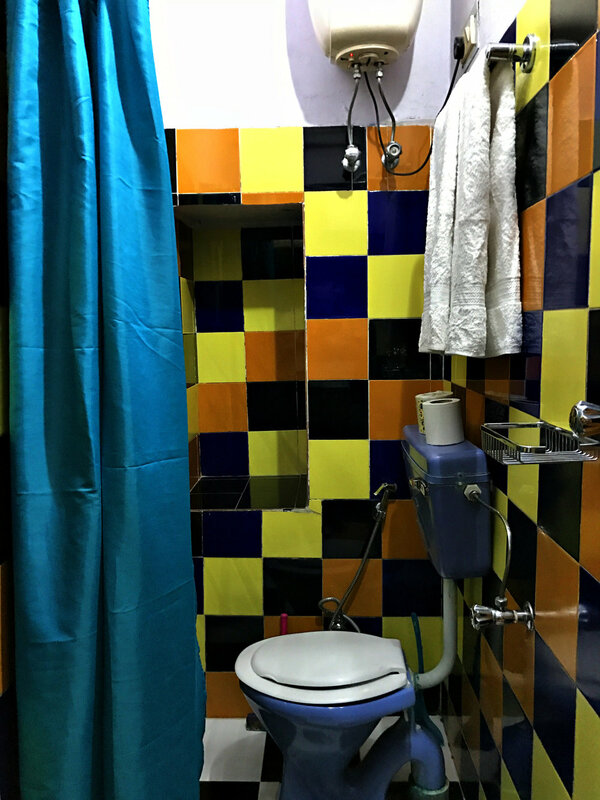 I tried 'em all during my journey in India, cheap hotels, one fancy hotel, a hostel and this guest house. 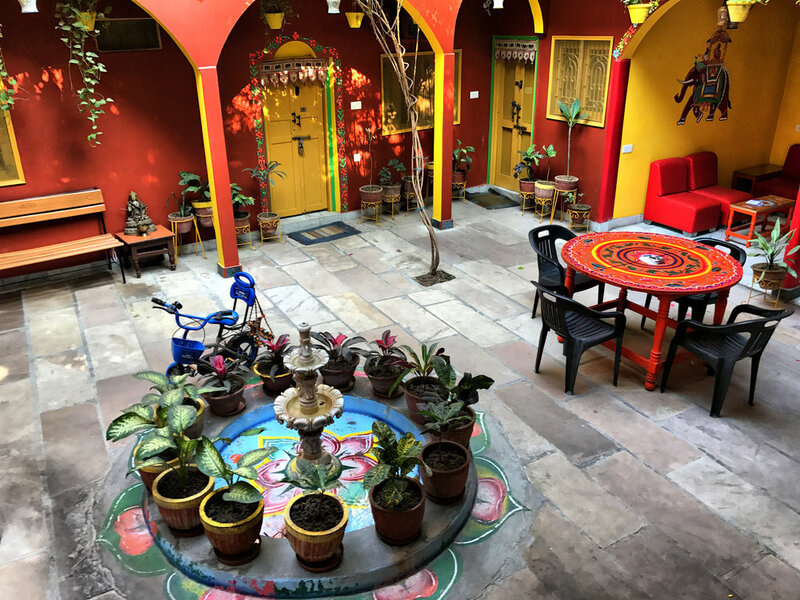 Maybe it was the perfect match with the city, the calm laidback athmosphere at this guesthouse & the spiritual vibe all across Varanasi. All I can tell is that, Ganpati fulfilled my expectations, and that this guesthouse made me feel, like I initially expected it to be. I remember when my friend José showed me his photos of Varanasi and a couple of images of this guesthouse. Both just matched perfectly together. When I was trying to book a room at the website "booking.com", I was told that the guesthouse was sold-out during my stay in the city. But luckily a week later, I got to manage to book the last room available. GANPATI was the second "hotel" I checked-in at in India, and without any doubt it was the place where I instantly felt at home. 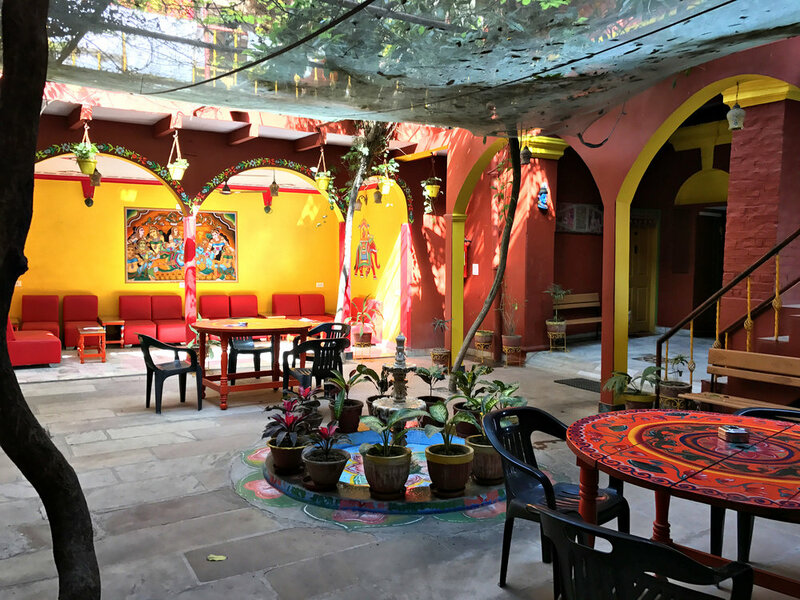 I got a warm welcome by the guesthouse-staff and you could really feel, that the clerk at the front-desk, made some efforts to explain me how the boat-trips work, how to get to the roof-top restaurants, how much I should pay for the different services along the ganges river. I didn't feel like a living dollar-sign at this hotel. I read some unpleasant reviews about the guesthouse, so I really didn't know what to expect. Once I figured out that I would get room number 7, right in the middle of the courtyard, I felt really happy. There are lots rooms which are facing towards the river, however the ones in the center of the building, seem more peaceful and colorful. All room-doors were locked with a golden-shiva-lock. Everything was very charming about this guesthouse, the colors, the vintage locks, the scent of the rooms... The rooms weren't fancy at all, but you aren't asking for any kind of luxury when checking-in at a guesthouse. The rooms were very clean, the bathroom as well. The bathroom lacked some space, but it didn't bother me at all. I loved staying on my bed during the day, with the yellow room-door wide open. You could hear the calming noise of the water-fountain. On the roof-top there was a restaurant, that was serving food til midnight. Their menu consisted of only vegetarian dishes. The dishes were very simple, but I couldn't complain. The waiters were extremely friendly, and the food was very cheap. During my 4 days in Varanasi, I only had food at their restaurant, because everything just seemed perfect. The food tasted fresh, and of course I didn't get sick of it. There's a main-exit that leads straight down to the ghats, right to the river's edge. 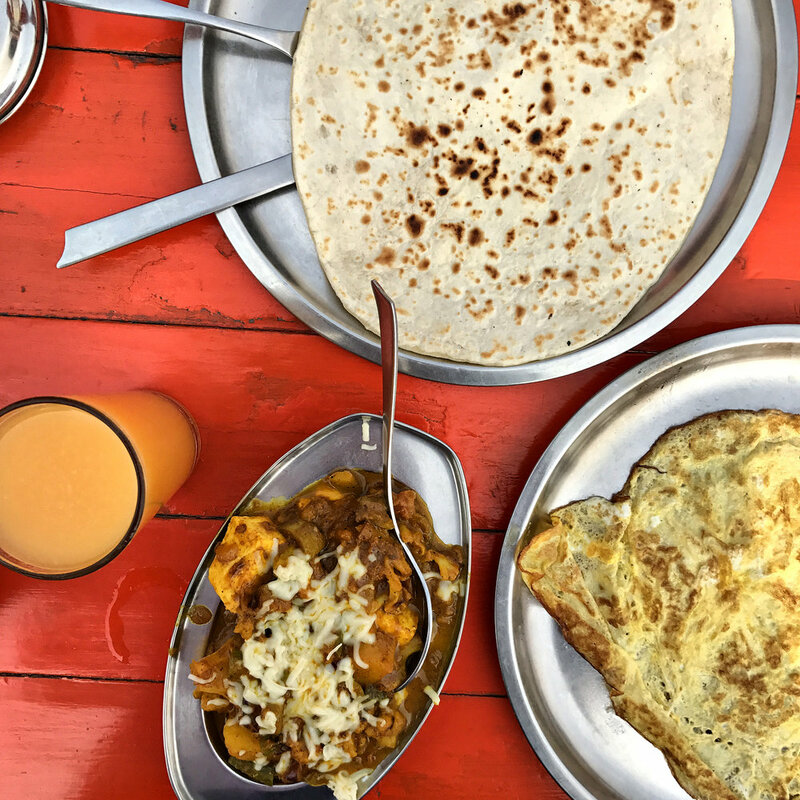 On the rooftop you can enjoy your breakfast or lunch with a beautiful view all over Varanasi. What can I say? There's nothing to complain about. When I was checking out, I told the staff, that I took the room's hand printed laundry tote bag, because I wanted to keep it as a souvenir. I offered them to pay for it, but the lovely man at the desk told me I could keep it for free. As soon as I left the guesthouse, I got one last "namaste" from the door-man. 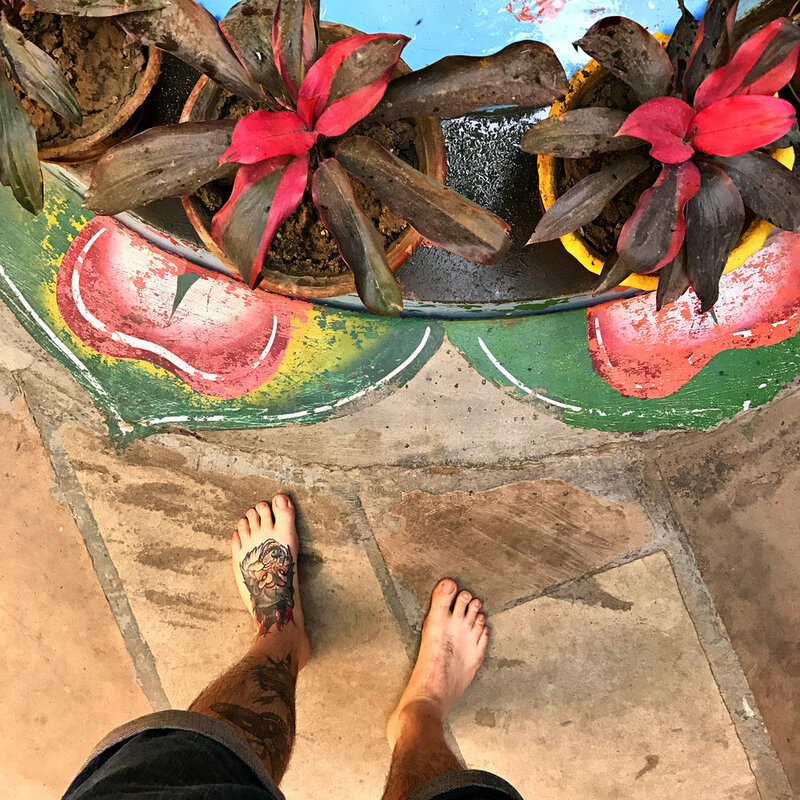 Everytime I left or entered the guesthouse, a "guard" opened the door, put his both hands together close to his chest and greeted me with a "namaste". 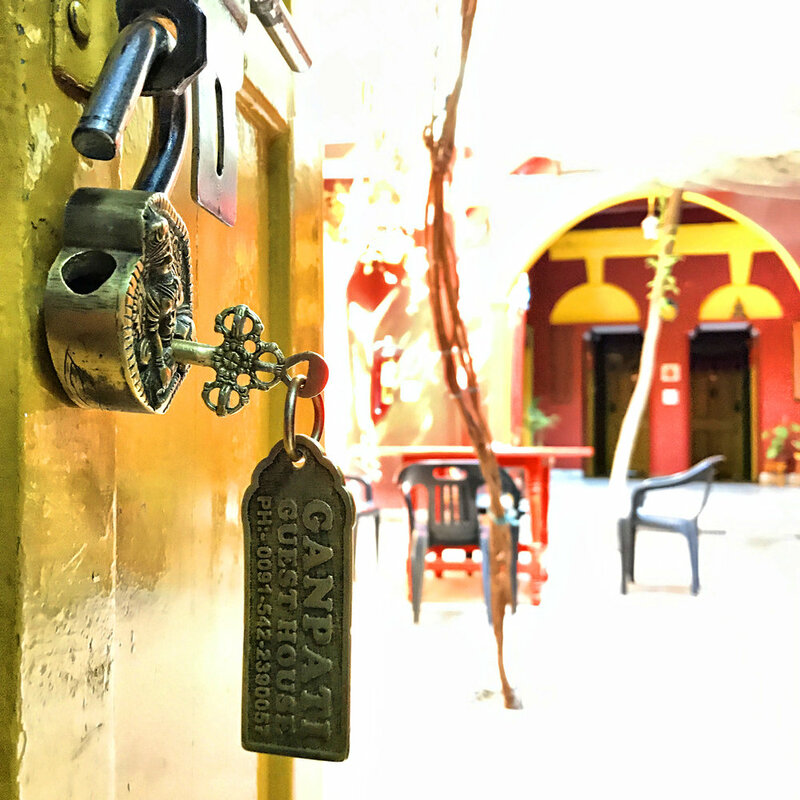 I loved GANPATI GUESTHOUSE, it was one of the few lovely experiences I brought back home from India.